Mohamed El-Erian, Allianz's chief economic advisor, declared Friday that the US will prevail in its trade war against China because China is a "less open economy" than its western rivals. El-Erian said that earlier this week, which ended in relative terms, we are winning and we will win the trade war," according to CNBC. "When people realize that at the end of the day, the US will prevail, because [China] is a less open economy, because [the US] is a more dynamic economy, that ultimately you may end up in a situation where the US' position in global economic terms is better off," he said. Still, the former one-time heir to Gross may have gone too far in describing Trump's nontraditional negotiating tactics. El-Erian said as long as the risks are managed, everything will be fine as far as the US is concerned. "One of the upside risks, is that you may end up changing the global landscape in a way that favors the US. Because countries will realize, if we slip into a trade war, while everybody suffers, [the] US does better in relative terms," he said. El-Erian is perhaps the most well-respected figure in the US financial community to come out in favor of Trump's aggressive tactics on trade. His remarks recall one of Trump's most infamous trade-related tweets: "When you’re almost 800 Billion Dollars a year down on Trade, you can’t lose a Trade War! The U.S. has been ripped off by other countries for years on Trade, time to get smart!" While El-Erian is looking for opportunities, it seems like nearly every other prominent investors is focusing on the risks - Guggenheim Partners' CIO Scott Minerd and Bridgewater Associates founder Ray Dalio are just two prominent members of the US financial community to warn about a trade-war induced crash in recent days. 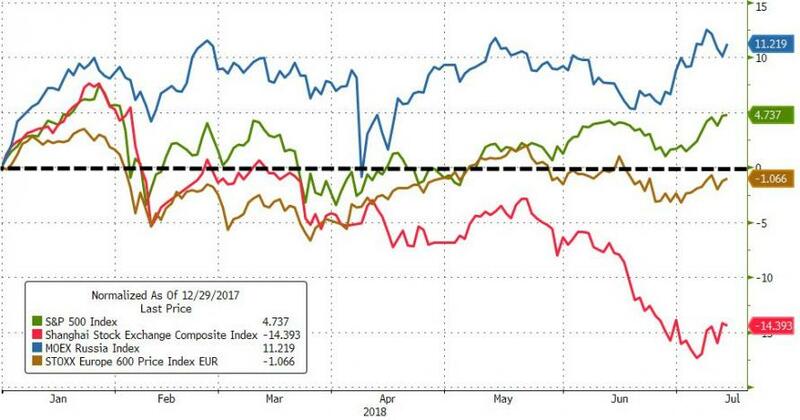 However, while El-Erian believes that US is/will win the trade war, judging by the stock markets' performance, Russia is winning for now. And judging by this week's price action in bonds, stocks, and the dollar - "everyone" can win in a trade war.